Cardboard Tube The Type 7 can is made completely out of cardboard including the top and bottom. A paper label identifying the balls covers the can. This type was made around the time of World War II when there was a shortage of metal. A string was used to tear the paper label from around the top for opening, much like the metal key wind strip found on metal cans of the period. 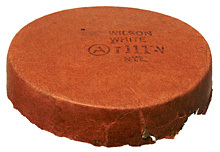 Height Diameter 8 1/16″ 2 7/8″ (20.6cm) (7.3cm) Production: 1926 – 1945?